Little Red Feather, the largest racehorse ownership syndicate based in California with more than 75 horses and more than 450 active partners, will offer its clients an exclusive opportunity to play for a $1 million bonus at February’s $3 million-estimated NTRA National Horseplayers Championship (NHC). In addition, the Little Red Feather partner with the best finish at #NHC19 will win a $10,000 credit to use toward ownership of a future Little Red Feather offering. 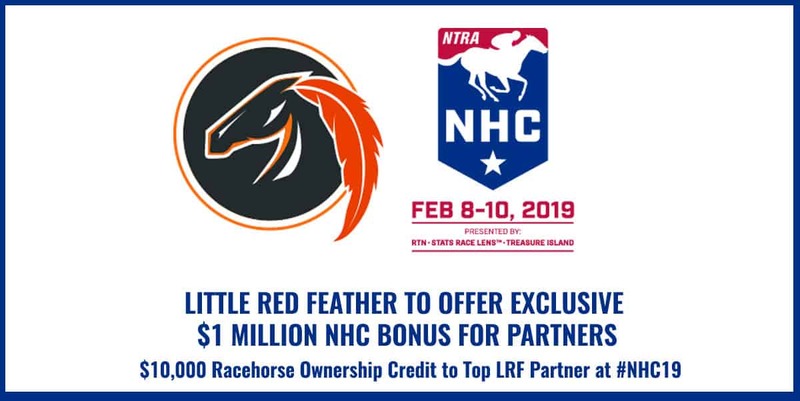 The Little Red Feather (LRF) partner with the highest finish on the 2018 NHC Tour will become eligible for the $1 Million Little Red Feather Bonus, to be paid out if they go on to win the world’s richest and most prestigious handicapping contest, the NHC, set for Feb. 8-10, 2019, at Treasure Island Las Vegas. The $10,000 “LRF Credit” to be used for any new LRF share purchase will be awarded to the LRF partner who qualifies for and plays in the 2019 NHC and finishes highest among eligible LRF partners. Last month’s NHC boasted a record field of 568 individual players, including LRF managing partner Gary Fenton. Updates on NHC Tour standings of Little Red Feather players will be shared weekly in communications to members. Prospective partners can become eligible for the NHC bonuses by joining a partnership before June 30, 2018. This year’s NHC grand prize was worth $800,000 for winner Chris Littlemore, who also earned an Eclipse Award as Horseplayer of the Year, a berth into next year’s NHC finals, an entry to the Pegasus World Cup Betting Championship, an entry to the Breeders’ Cup Betting Challenge, and annual subscriptions to STATS Race Lens™ and Racetrack Television Network. One must be a current NHC Tour member to be eligible to win NHC entries and earn NHC Tour points. To sign up for the NHC Tour, go to www.ntra.com/membership. Little Red Feather (LRF) is America’s premier racing and lifestyle club with more than 450 active partners and 75 horses, offering members and their guests peerless service, experiences, and racing at the highest levels. Established in 2002, Little Red Feather’s successes have included winning the 2004 Breeders’ Cup Mile (G1) with Singletary and selling Grade 1 winner Egg Drop for $1.9 million at the 2014 Keeneland November sale. More than 50 percent of Little Red Feather syndicates are comprised of previous partners. For more information visit littleredfeather.com.